Today, with the introduction of new technologies in a wider and more sophisticated range of compressors and ancillary equipment, every operator has the opportunity to select a compressor that will match their application requirements immediately and into the future. Due consideration must also be given to the quality and cleanliness of air being generated through the compressor and ancillary equipment. 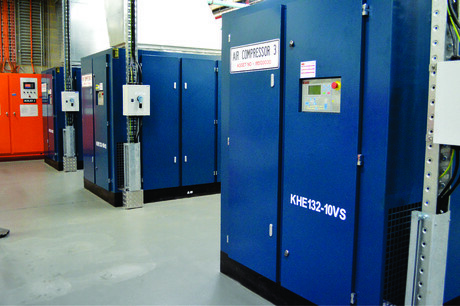 Potential contaminants such as dust, pollens, hydrocarbons, oil, moisture and other impurities can come from ambient air, lubricants and other pollutants in the air reticulation system which can also cause costly damage to downstream equipment as well as product spoilage, so it is important that compressors output ‘Food Grade Air’. Many larger food industries are opting to upgrade to new generation, two stage rotary screw air compressors which can more than match required air generation with less energy input, and that means considerable savings in energy costs. “Our two stage machines operate under far lower bearing loads which means lower maintenance requirements and lower likelihood of breakdown. They just purr along! Combine the two stage air compressors with VSD and the energy savings offer surprisingly fast payback on capital expenditure,” Martin added. For specialised food industry applications, air compressors can be designed or adapted to suit environmental conditions, required air quality, demand variability and other considerations. However, specifying the right replacement compressor alone won’t maximise efficiency, cost saving and air quality unless the air delivery lines, couplings and ancillary equipment such as filters, dryers and receivers are also well maintained. For this purpose, Southern Cross conduct a complete system survey to detect leaks and any inefficiencies that require fixing to gain maximum performance and energy cost savings from every new installation. To ensure continued, trouble free and cost efficiency of the air compressor and systems, Southern Cross provide customised customer maintenance programs. Compressed air links innovative aquaculture operations. Having utilised compressed air in their land-based operations for years, Huon Aquaculture Tasmania have successfully trialled the use of compressed air in their sea-based operations. Huon commissioned 37KW Southern Cross KHE compressors on feed barges at the centre of each major pen configuration to power the salmon recovery from pens to the feed barges. This innovation has proven highly successful allowing remote selection of up to 12 separate pens to be centrally and individually controlled. With Huon’s ever evolving innovation and development of safer and more efficient systems, management have now opted to upgrade and replace these well worked compressors with seven new models. Working with Southern Cross designers and technicians, the new Huon customised compressors will utilise a high level of stainless steel componentry and be fully encased in stainless steel cabinets to better weather the extreme off shore conditions encountered in the salmon farm environment.